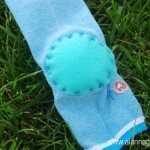 This Easy Water Bottle Sock Dog is an easy beginning sewing project for any kid that can handle a needle and thread. The craft then becomes a useful project that helps you hold your water bottle and is fun too. Select your socks, floss and buttons. You can use a lonely leftover sock or purchase some from the Dollar store. To create the muzzle area, turn the sock insice out and place stuffing in the heel of the sock. For a round nose. See pictures below. If you want the nose area to be round cut a circle of felt and sew it over the heel full of stuffing. After the nose area is complete, slide the sock onto your water bottle. 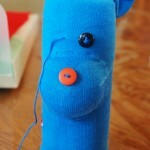 Use embroidery floss to sew on the nose and eyes and other details you want on the face. 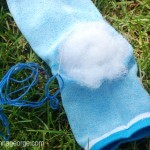 To create the ears, cut a slit in the top of the sock. Ears can then flop down or you can tie a piece of embroidery floss around them to make them stand up as we did with blue dog. 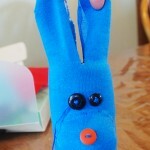 Finish up your animal sock cozy by adding any extra details. Then slide it over your favorite water bottle and fill with an icy cold drink! Alanna began her career as a Design Manager in the scrapbooking industry. After the birth of her first daughter she turned freelance designer, crafter and stay-at-home mom. She resides in Michigan with her husband and their four kids (2 girls and 2 boys). You can find more crafting ideas and how to's at her blog, Alanna George | The Craft Nest (www.alannageorge.com).